Who should attend: Healthcare professionals (including physicians, dentists, dental assistants, nurses, physical therapists, registered pharmacists, paramedics etc) who need to know how to perform CPR, as well as other lifesaving skills, in a wide variety of in-hospital and out-of-hospital settings. The Basic Life Support (BLS) for Healthcare Providers Classroom Course is designed to provide a wide variety of healthcare professionals the ability to recognize several life-threatening emergencies, provide CPR, use an AED, and relieve choking in a safe, timely and effective manner. This course gives the student 3.5 CME hours recognized by Dubai Health Authority (DHA). Skills are taught using AHA’s research-proven Practice-While-Watching technique, which allows instructors to observe students, provide feedback and guide students’ acquisition of skills. Each student receives the highest quality course material to supplement their learning. The Perfect Help trainers are all internationally BLS accredited first aid instructors and qualified nurses with hospital experience. All instructors have been approved by Dubai Corporation for Ambulance Services (DCAS), the regulatory body for First Aid in Dubai. 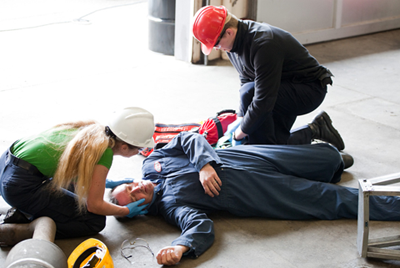 It is mandatory for all healthcare providers to be BLS trained and have a valid certificate. Qualification is valid for 2 years and should always be up to date. Does this course satisfy all UAE legal requirements for hospitals and clinics? Yes, the American Heart Association's BLS Certification is recognized by Dubai Municipality, Department of Economic Development (DED), Dubai Health Authority (DHA), Dubai Corporation of Ambulance Services (DCAS), and Knowledge and Human Development Authority (KHDA). Will I get CME points? Yes, completing the BLS course will give you 3.5 CME hours as recognised by Dubai Health Authority (DHA). Yes, we do offer group rates. Please call us on +971 (0) 4 343 3799 for more information. It is up to you! We can teach in your company venue, or at our training centre in Commercial Bank Building (Sheikh Zayed Road), near FGB Metro Station. For a detailed location map and instructions, please visit the "Contact Us" section. We come to offices in all Emirates to teach for groups with a maximum of 6 student per session, in line with American Heart Association's guideline. Yes, we teach 6 days a week (Saturday - Thursday) and can adapt our timings to suit your needs. Please call us on +971 (0) 4 343 3799 for more information.